Le Caramel - Le Petit Vapoteur. Find a timeless Caramel Flavour, illustrated gourmet, finally for the Electronic Cigarette. Available in 10ml PET bottle with dropper and childproof caps. The Caramel composition: 60% of Propylene Glycol and 40% of Vegetable Glycerine will fit all type of devices. 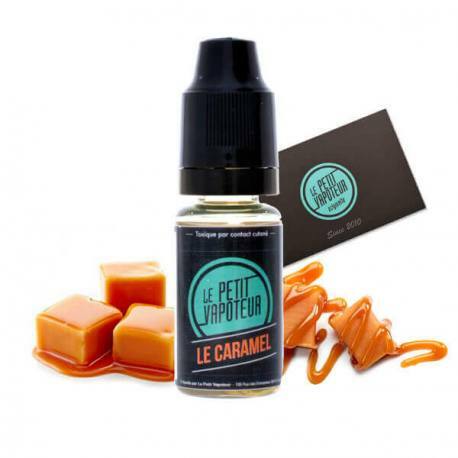 The Caramel e-liquid by Le Petit Vapoteur is made in France. The collection Le Petit Vapoteur offers now premium quality e-liquids. Made in France, the collection Le Petit Vapoteur only uses the best products for your daily vape. A great and wide choice available in 10ml bottles. A composition 60/40, fitting all types of device. NO sugar, oil, diacetyl, nor rubber or GMO substance. No aromatic allergen substances which require to be declared. Eventually, alcohol to fluidify some composition as Red fruits ( Fruits Rouges) and Fresh lemon (citron givré). . Eventually pure liquid nicotine, USP Grade. The e-liquids from the collection Le Petit Vapoteur are available in 10ml ( polyethylene terephtalate) plastic bottles (no bisphenol), recycled(PET1), with dropper, sealed and with childproof caps. Customized labels (consistent with the european legislation) displaying the drawings and name of the flavour, the composition, the nicotine dosage, the name, address of the company, the use-by-date and batch number. Concerning the e-liquids with nicotine, a regulatory pictogram, recommandations, and a "Danger" tactile label for impaired people is placed on the bottle. The dosage you will chose will depend on your dependence. 16 mg for high dependency. 12 mg for medium dependency . 6 mg for low dependency. 0 mg for no dependency. For an optimum flavour preservation, keep your e-liquid Le Petit Vapoteur away from the light, in a dry place and at an ambiant temperature ( around 20°C). Le caramel, taux nicotine 6mg parfait pour moi. J'ai l'impression qu'il a plus goût de cookie.